At Portable Energy Gurus, we’ll help you find the right portable generator, and quickly with our unbiased reviews. Emergency Preparedness? Check. RV trip? Check. Camping? Check. We’ve got you covered! In the modern world, we are completely dependent upon power. We need electricity from the moment we wake up till the next day when we wake up. Yes, we need it during the time we sleep too! Most of us are fully dependent upon the electric grid to supply the required energy literally to run our lives. We don’t realize our dependency until there is an emergency and the power goes out. There are many options available to reduce our dependency on the electric grid. We can become energy efficient and independent and still use all our modern appliances. In this article, I will discuss several options which are there to make modern life less stressful when there is a power outage. There are two types of generators; one kind are the permanent standby generators, and the other is the portable ones. Both have their pros and cons. Before you go out and buy a generator, there are a few questions that you need to ask. The first thing you will need to do is to determine the usage. What do you want the generator for? Depending on the purpose of the generator itself, you may make a different purchase choice. If you need a solid generator as a back-up in the case of emergency power outages such as storm, which can power your entire home on a basic level, then you may wish to choose a larger, more powerful option which may not be as easily portable. 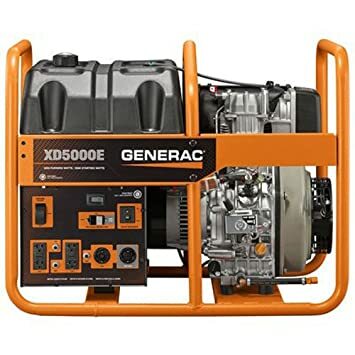 On the other hand, if you plan to use the generator frequently in different locations to power items such as mobile lights, amplifier speakers or anything you may choose to use on the go, you would greatly benefit from a more portable generator which you can easily carry from place to place, but still provides more than adequate power output for the task. What are your power needs? Again, this will largely depend on the type of equipment you plan to run using the generator and also the environment where it will be run. Portable generators can provide a surprisingly high amount of power in terms of output. Especially at a higher price range, they can rival many of the permanent standby counterparts. This is something you will have to consider carefully before making your purchase. Often, it is better to slightly overestimate your power needs rather than fall short. Underestimating your required output can lead to dreaded power outages at the most inconvenient of times. At home or in casual surroundings, this may be acceptable and easy to overcome. However, if you are running a commercial event or providing a service, it can have dire consequences for your business. Always overestimate your need if you are dealing with paying customers. A final point on power is also safety related. The last thing you want is to overload your generator. This excess power can pose both a safety hazard and prove financially very costly for you if the worst should happen and an overload occurs. Choosing your level of power output is much like buying clothes. A little larger will always be better than a little too small. The next question, on which the answers to the first list will depend is, what your budget is. Generators can cost from a few hundred dollars to thousands of dollars. What do you want to spend? How much can you spend? You will need to determine this. The reason I am putting the budget after the need is that, determining the requirement first will give you a better judgment on how much you want to spend. E.g., if there is a question of life-saving devices running in your home, you will have to determine the amount of power you will need and for how long before you can decide how much to spend. Once you have determined your wattage needs and established how much you want to spend, the next step is to select a generator. As I have mentioned earlier, there are two basic kinds of generators to choose from. The permanent standby kind or the portable kind. The selection of portable generator models is large. The one you decide on should provide you with your electricity needs. It should power your devices, your appliances, your tools, etc. The best kind of generators is light in weight, quiet, and fuel efficient. Practical generators will have multiple outlets of different kinds for your various needs. You should be able to hook up what you need when you need it. 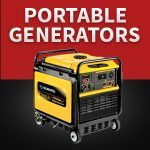 There is a vast gamut of portable generators available in the market today, depending on your need. If you are looking for one just as a backup when the grid fails, carry one to a job site, or for your camping needs, we will help you find one that is suitable for you. 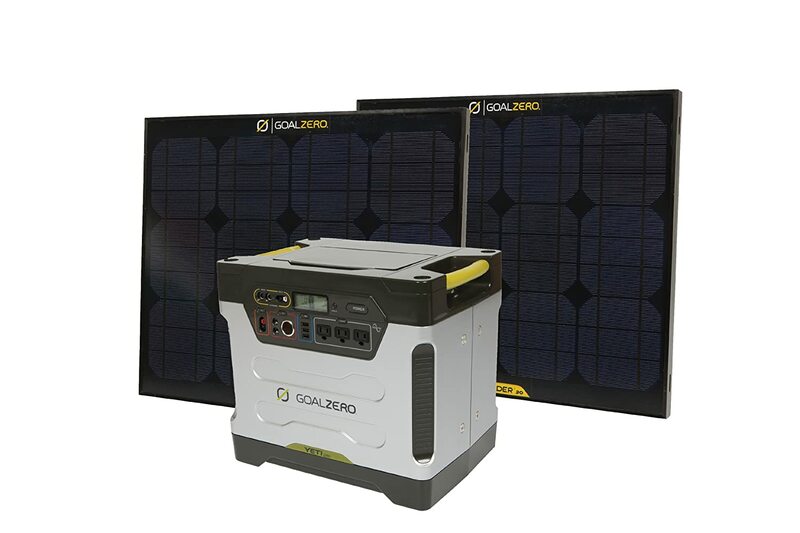 The development of solar-powered generators is a real game changer when it comes to deciding which portable generator to buy. Even with portable generators, the major inconvenience for the user was that to produce electricity, regular generators require some other form of fuel input, such as gasoline or diesel. Solar power changes that for the better and makes portable power generation a whole lot simpler. Here we can take a look at some of the best available solar generators on the market which best suit your needs. 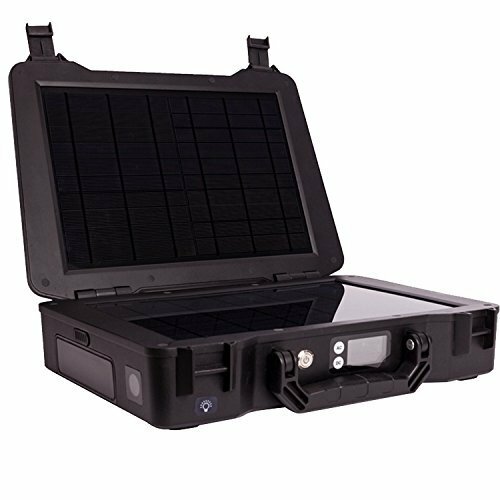 The Yeti 400 comes from one of the industry leaders in the development of portable solar power. It is the definition of portable. It is not too heavy and relatively easy to carry around, place in any location discreetly and excellent for traveling with. The Yeti 400 is perfect for those outdoor camping and fishing trips. It is excellent at keeping your basic devices such as smartphones and laptops functioning in the great outdoors with its 120W 12V ports. It also features a continuous 300W & 600Wsurge inverter and several USB ports. This makes it ideal for keeping you connected by the lakeside or in the case of temporary power outage. The accompanying Nomad 20 solar panel offers a good charge to the main battery under the correct conditions too. The panel itself can be easily folded for transportation along with the generator or for storage purpose. Another very functional and logical feature is the ability of the Yeti 400 to be connected to other Yeti 400s in order to produce a higher runtime. This is very convenient and especially beneficial on group trips when a number of friends decide to bring theirs along and pool power. The Yeti 400 is lightweight, quiet, easily portable, versatile and of course environmentally friendly with its solar power. On top of these things, it also looks the part. Its sleek design is not something which power generators are usually renowned for, but this one will turn some heads. If you need an easy to use, connective portable power generator which you can pick up and bring anywhere in an instant, then the Yeti 400 is perfect for you. Sticking with Goal Zero for our next look at a solar-powered generator. The 1250 however really increases the size and output of the device in comparison with the previous device. With the naturally bigger size, portability is quite reduced with the 1250. However, what is lost in terms of portability, is regained in droves with power output. Of course, the larger Yeti model has the capability to easily charge all of your standard mobile devices and laptops. Because of its larger output, it can also easily power fridges, fans and other bigger scale home appliances. It is silent, safe and clean for both indoor and outdoor use, coming with Boulder 30 Solar panels which provide fast and efficient charging in the most environmentally protective manner. Devices can be charged and items powered with the exact same speed and efficiency as wall charging. 24 hours heat from the sun will provide enough energy to fully charge the 1250 from the accompanying solar panels. This is impressive for a large-sized generator. There are also more traditional ways to charge the device. A regular wall outlet will give you a full charge of the Yeti 1250 in around 18hours and finally, whilst not the ideal method for everyone, you can also charge the generator in your car. A 44hour charging duration will give full power to the Yeti. This is not the most efficient method, sometimes though, the situation dictates what action is necessary. It is therefore nice to have the additional charging options. 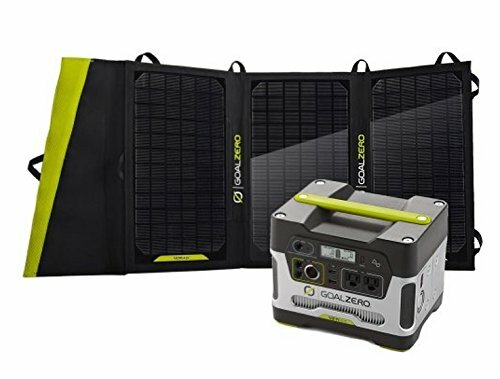 The Goal Zero Yeti 1250 is an excellent portable generator choice for those going on a longer, more isolated excursion who want to maintain connectivity with all of their daily luxuries. It is also perfect to have around home, certain of fast charging for a number of larger items if the need arises. Going from large back to little with our last of the solar portable generators. The Renogy Phoenix certainly lives up to its name in terms of size, though this is certainly not a criticism. The reduced size of this model actually means that portability is fantastic. This is the major purpose and benefit of the firefly. It can provide a solid amount of on the go power, anyplace, anytime. It is perfect for mobile application and charging devices on the move or in an emergency situation. Its two 10W solar panels are fully built into its briefcase style design. This makes it compact and perfect to carry around just like a bag, even if you never have to use it. It also houses a 150W inverter, 10A charge controller and a 16Ah lithium battery in a neat and compact set up. The waterproof case is also highly durable, this means it is completely ready for any intrepid adventure or scenario in which you may find yourself. It has very convenient AC/DC output switching buttons, allowing you to switch type in an instant and its LCD display monitor which is also built in, provides accurate, up to the second data regarding battery status and other important visuals. Overall, the Phoenix is everything you could want in a portable generator. Easy to use, highly portable and rugged with excellent connectivity options. It is certain to never see you stuck in a difficult situation without power, regardless of circumstance. Gas-powered generators will certainly give you more bang for your buck in terms of power. Also, this means that so long as you have enough fuel, you can provide power at all times. Particularly suitable for sustained power outages and unexpected events. 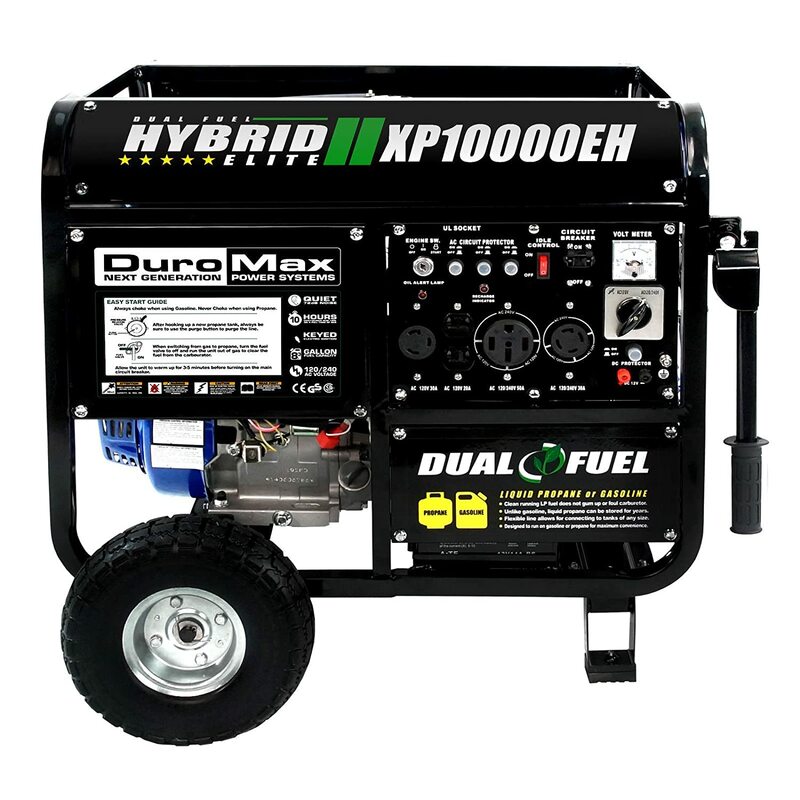 Gas powered portable generators provide a unique combination of convenience together with the reliability and high-level power found in most models. Beginning with a supreme value choice, the champion 3800 is a model for everything good about gas powered portable generators. With its 3800 watts of running power, it is a strong start from this industry leader in power generators. The Champion comes with an electric, push-button start. This provided comfort and convenience in starting the motor without having to worry about breaking a sweat or doing yourself an injury. Even more convenient is the fact that the starter battery remains charged from the machine running. In fact, the Champion is dual fuel, also running off propane. This is an added bonus, although most output power is gained when running from the 3 to 4-gallon gas tank. It has a number of excellent features to boot. These include folding handles for easy transportation and never-flat tires. This model makes an excellent addition to your RV when traveling or just to keep around the garage for some unexpected events. It is relatively quiet operating from its 224cc engine and will provide for a total running time of 9hrs on a full tank of gas. The convenience and wealth of features are bolstered to an even higher standing when we consider the fantastic pricing of the Champion 3800. It really does deliver above and beyond the call of duty within this price range. If you are looking for supreme value for money in combination with a highly efficient and adaptable model, this is certainly the choice for you. Cranking it up to another level of power with this outstanding offering from Duromax. The XP10000EH sets a powerful standard when it comes to portable power generation that, in truth, few can match. This model is no different, with a whopping 8000W running power output, it can simply blow away some of its rivals. With great power, comes great responsibility. It is often said and in this case is also correct. The Duromax prides itself on being able to charge anything, anywhere and at any time. This is a large feat to live up to, but with the power of this dual propane and gas engine bursting at the seams, the XP10000EH makes it look effortless. This model has a very useful key starting function, meaning you can get the motor running as simply as you would a car. Fear not if the battery ignition is not charged, there is also a recoil starting option in that event or for the traditionalists at heart. The control panel of the XP10000EH possesses multiple outlets of varying voltage output and socket shape. This means that regardless the plug and voltage type of your device, rest assured it can be easily handled. It also has an engine muffler which helps to greatly reduce the noise. This is an essential component of such a powerful machine. Given its size, the XP10000EH is remarkably transportable and also comes with a useful mobility kit to help in this regard. Naturally, with the supreme power on board, it comes at a more premium price point than some other, less powerful models, but, it certainly provides value for money. An excellent choice for someone looking for a durable and hardworking portable generator that can handle pretty much any situation. Finishing off our round-up of some of the best available portable gas-powered generators is a model with an instantly recognizable name. Energizer produces the eZV200P and they have done a magnificent job, bolstering their already fine reputation in the power industry. The company pride themselves on durability and long-lasting quality, two attributes which this model possesses in abundance. First off, we should note the tidy appearance of the energizer, it looks both modern and compact. These are two advantages that cannot always be noted of power generators, but being easy on the eye is of great importance in today’s market. We want a product that not only does the job well but also looks the part. The eZV3200P is a 3200W, gas powered generator. Considering this fact, it is quiet as a mouse. This makes it excellent for use around the home or during camping trips without the added worry of disturbing neighbors or people nearby. It is also lightweight in comparison to similar competitors. This makes it rather easy to carry around without adding too much strain. It has several available outlets for multiple voltage power sources. This is in addition to its parallel connectivity option, meaning that it can connect to any other eZV model for extra power and longer lifespan. This is an excellent option if camping in groups or you are a big admirer of the series. It also sports an innovative and super convenient remote starting facility. Sporting a 7.4l tank along with its 208cc engine and a three-year warranty, you can be sure that Energizer will live up to their reputation for providing superior longevity on products. This also helps to remove a lot of stress in the unlikely event an issue should arise. This is an excellent choice for those not requiring the huge power of the Duramax but still wanting a long-term power generation option from a very reputable source. The final sector which we will review in helping to find you the best possible portable generator is diesel generators. These, in many cases, can offer a more cost-effective, durable and hardworking generator than other categories. This along with other benefits such as reduced noise levels. Let’s take a look at the best available models. Starting off with a true beast of the diesel generator market. The 6864 leaves no stone unturned when it comes to both being efficient as well as ultra-powerful. With this generator, you will never find yourself running out of energy. The diesel tank on this model holds a remarkable 12 gallons. This gives it a very sustainable run time of 32.4hrs when operating at 50% capacity. This is a statistic which will turn heads and is much longer than any of the previous models we have reviewed. The 1¼ inch thick steel frame also helps to protect the Generac from sustaining any damage. This makes it ideal for most construction sites or indeed any kind of rugged environment. It truly is the portable generator for professional tradespeople. Its one-touch start is of ultimate convenience on those dark and cold winter mornings or evenings when you dread the thought of trying to pull-start an engine. The hour meter equipped on the 6864 also makes it more than ideal for checking service intervals to ensure everything is kept as up to date as possible. Being diesel, the engine is also extremely efficient and long-lasting. This In addition to its being much quieter and requiring of a lot less maintenance than engines of other fuel types. This model would be an excellent choice in construction on the events industry where generators could be running for full days at a time and rely heavily both on fuel efficiency and durability. Another model from Champion, this time of the diesel variety and no less impressive than the last. This model provides another fantastic alternative to gas and solar portable power generators. 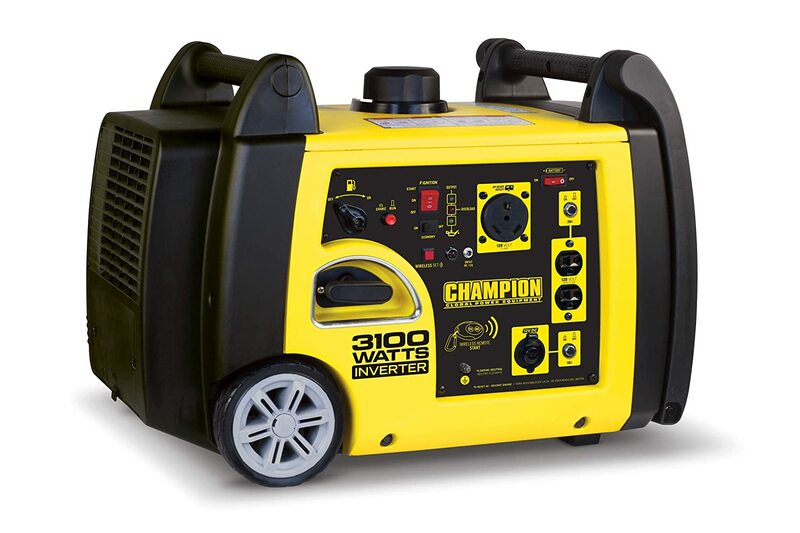 This 3100-watt generator is perfect in the mid-size range to be both productive and easily portable, traveling from job to job and location with you conveniently. 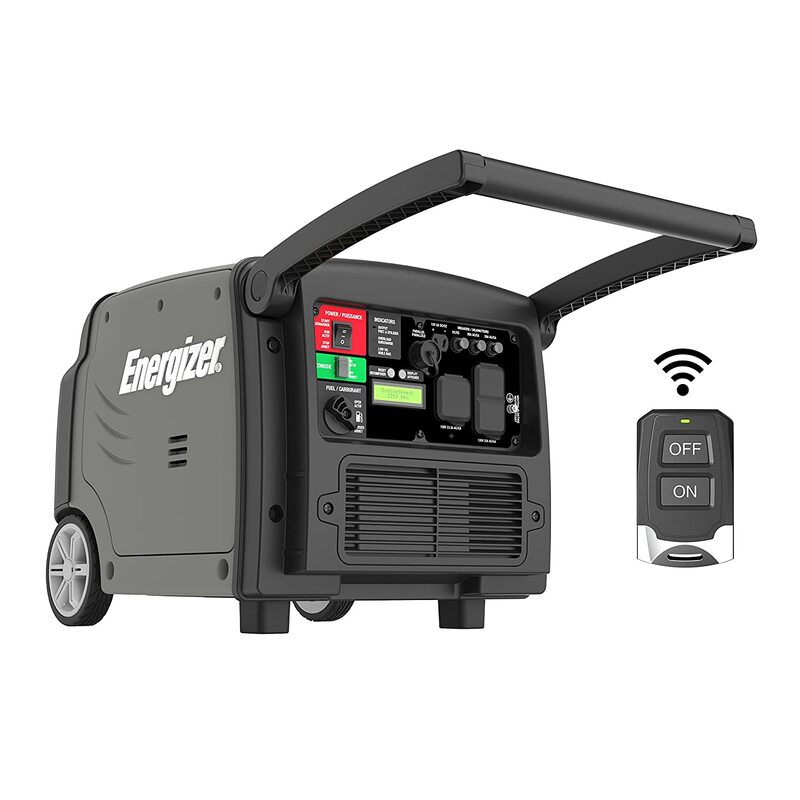 It offers the unique feature of a wireless remote start, this is something we do not always see and represents the height of convenience and comfort within a generator. 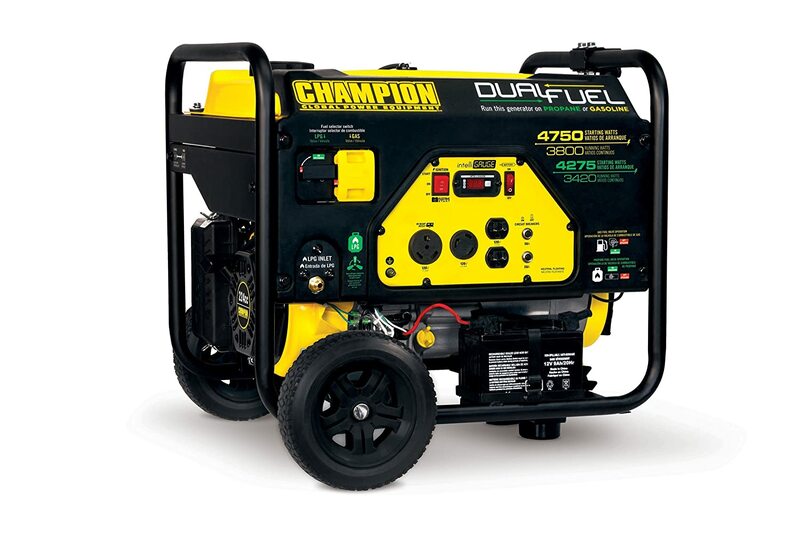 Remarkably, this feature allows you to start and stop the generator from a distance of 80 feet. This is positive both in the sense of comfort, but most importantly from a safety viewpoint. With so much control, you can suddenly avert the danger of any young family members or pets who may become too curious about the inner workings of the equipment. The fueling of this model is also very socially responsible. It uses less than 3% THD to provide the most environmentally friendly power possible under the circumstances. You can then focus on enjoying your camping trip without being burdened about worries of your eco-neglect. Champion has taken care of everything. The Champion model offers an 8hr run time when working from a 25% load, which is also quite impressive considering the wealth of power adaptor and USB options as well as the quick touch panel and remote features offered. This is an awesome choice for those who are enjoying a weekend away with a group of friends and are likely to be charging multiple devices at once. The slick features and sharp design will also create a great talking point among the group. By bringing this model along on your next trip, one more champion will be crowned. Last but by no means least in our portable generator review is the diesel-powered PG7000D from Pulsar. This one will not be easily missed out. It comes in at a bigger size than most of the others and its presence certainly won’t leave you feeling lonely on a dark and frosty night. The PG7000D also packs a hefty punch as you would expect. Starting at 7000W and with a constant running speed of 5500W, this is enough to meet basically any need that you would have on a personal outing or indeed in most professional capacities if used on a work site. It possesses multiple AC outlets at 120V and also at 240V and a 12V DC terminal for battery charging. Fully loaded, it is designed to run for many hours in a variety of rugged conditions. It features an electric start along with a 3.3-gallon fuel tank and circuit protection to avoid any overloading. It really is a highly durable machine. It is also quiet enough to be operational for long periods of time without causing noise pollution. The PG7000D is ideally best suited to a construction environment and even features a special hook which allows it to be hung from a crane whilst simultaneously operating to provide power. 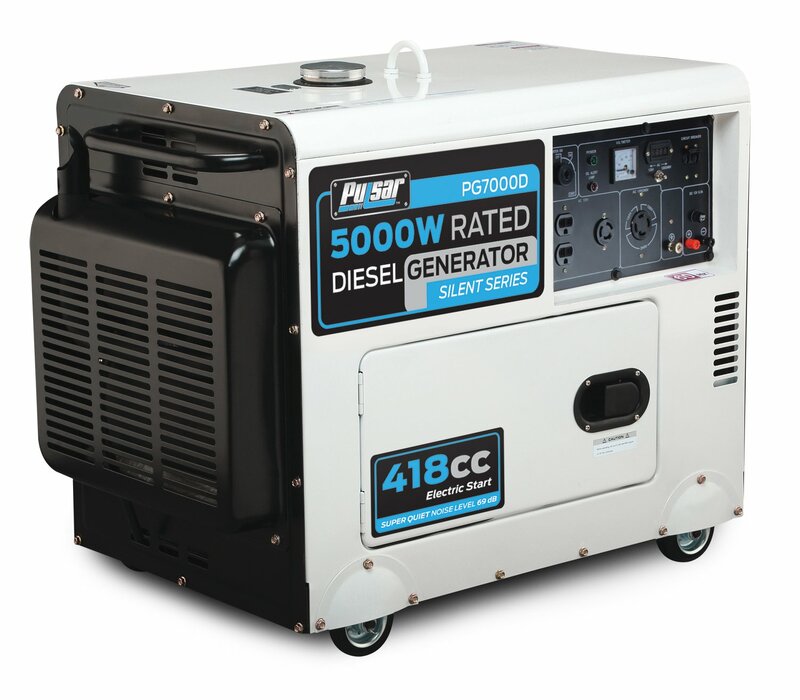 Therefore, if you have a construction project on the go or are a site manager or contractor, this could be the perfect portable generator for you. Safety features such as overload protection, spark arrestors etc. In concluding this mammoth review of the many available options you are presented with when choosing your portable generator, hopefully, we have proved helpful in some respects by providing insightful knowledge on some products you may not otherwise have considered. As we can see, there are many options available. This can be exciting but also daunting to many, especially upon a first purchase. The key is to ensure that you take your time and consider the initial budget and power requirements carefully at the outset. This will undoubtedly lead you to make a better-informed choice. From that point, we have reviewed products which cover all pricing and power options, this should provide you with a well-rounded insight into the market and what is currently available. This is key to making sure you are happy with your power purchase. Don’t forget that most of the models reviewed, come with some form of warranty, therefore, unexpected technical mishaps should not be a concern when making your portable generator purchase. Remember again that all of the models we have reviewed are available for purchase on Amazon at the click of a button. They will also provide you with all of the most up to date pricing information available. So, if you like one, just click the link to see more information and good luck with your next generator purchase! Yamaha Inverter Generators Review(The Better Portable Choice)? Which appliances use the most electricity at home? We are a participant in the Amazon Services LLC Associates Program, an affiliate advertising program designed to provide a means for us to earn fees by linking to Amazon.com and affiliated sites. Thank you for your continued support!